Tired of cold ears? 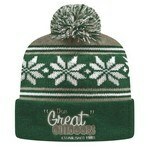 Looking to keep warm in a team-oriented way? Look no further than our custom beanies, which offer plenty of choices in color, style and embroidery options. This Custom Embroidered Acrylic/Fleece Beanie Cap features your custom logo embroidered in up to one color. 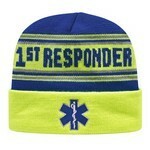 This Custom Embroidered Fluorescent Neon Beanie Cap features your custom logo embroidered in up to one color. This Custom Embroidered Logo Acrylic Two-Tone Beanie Cap features your custom logo embroidered in up to one color. 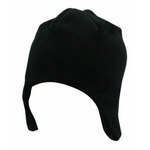 This Custom Embroidered Logo Trim Design Beanie Cap features your custom logo embroidered in up to one color. This Custom Embroidered Roll-Over Acrylic Beanie Cap features your custom logo embroidered in up to one color. The USA Made Cuffed Knit features several color options and allows inserting brand logo and other details to create interesting Company Logo Products. 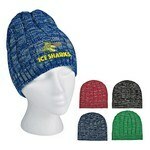 The USA Made Jacquard Knit features variety of color options, Customizable with your logo for Brand Recognition. Our USA Made Scarf w/ Fringe features five classic color options, Customizable with your logo for Brand Recognition. The Waffle Knit with Cuff features several color options to choose from and allows inserting corporate details for brand recognition. The Fleece Beanie features anti-pill finish and customization ability to create amazing Branded Giveaways with your custom details. Our Knit Heathered Beanie Cap features pure acrylic construction and allows inserting brand logo and message for impressive Company Logo Products. This Custom Embroidered 100% Wool Beanie Cap features your custom logo embroidered in up to one color. 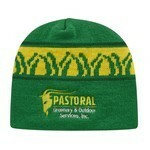 This Personalized Embroidered Acrylic/Polar Fleece Beanie features your custom logo embroidered in up to one color.